Representatives and direct taxes shall be apportioned among the several states which may be included within this Union, according to their respective numbers, [which shall be determined by adding to the whole number of free persons, including those bound to service for a term of years, and excluding Indians not taxed, three-fifths of all other persons]. The actual enumeration shall be made within three years after the first meeting of the Congress of the United States, and within every subsequent term of ten years, in such manner as they shall by law direct. The number of representatives shall not exceed one for every thirty thousand, but each state shall have at least one representative; [and until such enumeration shall be made, the state of New Hampshire shall be entitled to choose 3, Massachusetts 8, Rhode Island and Providence Plantations 1, Connecticut 5, New York 6, New Jersey 4, Pennsylvania 8, Delaware 1, Maryland 6, Virginia 10, North Carolina 5, South Carolina 5 and Georgia 3]. Immediately after they shall be assembled in consequence of the first election, they shall be divided as equally as may be into three classes. The seats of the senators of the first class shall be vacated at the expiration of the second year, of the second class at the expiration of the fourth year, and of the third class at the expiration of the sixth year, so that one-third may be chosen every second year; [and if vacancies happen by resignation, or otherwise, during the recess of the legislature of any state, the executive thereof may make temporary appointments until the next meeting of the legislature, which shall then fill such vacancies]. The times, places and manner of holding elections for senators and representatives, shall be prescribed in each state by the legislature thereof; but the Congress may at any time by law make or alter such regulations, [except as to the place of choosing senators]. The Congress shall assemble at least once in every year, [and such meeting shall be on the first Monday in December,] unless they shall by law appoint a different day. No capitation, [or other direct,] tax shall be laid, unless in proportion to the census or enumeration herein before directed to be taken. No state shall, without the consent of the Congress, lay any imposts or duties on imports or exports, except what may be absolutely necessary for executing its inspection laws: and the net produce of all duties and imposts, laid by any state on imports or exports, shall be for the use of the treasury of the United States, and all such laws shall be subject to the revision and control of the Congress. The judicial power shall extend to all cases, in law and equity, arising under this Constitution, the laws of the United States, and treaties made, or which shall be made, under their authority; to all cases affecting ambassadors, other public ministers and consuls; to all cases of admiralty and maritime jurisdiction; to controversies to which the United States shall be a party; to controversies between two or more states; [between a state and citizens of another state;] between citizens of different states; between citizens of the same state claiming lands under grants of different states, and between a state, or the citizens thereof, and foreign states, [citizens or subjects]. 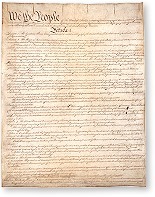 The Congress, whenever two-thirds of both houses shall deem it necessary, shall propose amendments to this Constitution, or, on the application of the legislatures of two-thirds of the several states, shall call a convention for proposing amendments, which, in either case, shall be valid to all intents and purposes, as part of this Constitution, when ratified by the legislatures of three-fourths of the several states, or by conventions in three-fourths thereof, as the one or the other mode of ratification may be proposed by the Congress; provided [that no amendment which may be made prior to the year one thousand eight hundred and eight shall in any manner affect the first and fourth clauses in the ninth section of the first article; and] that no state, without its consent, shall be deprived of its equal suffrage in the Senate. Done in convention by the unanimous consent of the states present the seventeenth day of September in the year of our Lord one thousand seven hundred and eighty-seven and of the independence of the United States of America the twelfth. In witness whereof we have hereunto subscribed our names. The person having the greatest number of votes for President, shall be the President, if such number be a majority of the whole number of electors appointed; and if no person have such majority, then from the persons having the highest numbers not exceeding three on the list of those voted for as President, the House of Representatives shall choose immediately, by ballot, the President. But in choosing the President, the votes shall be taken by states, the representation from each state having one vote; a quorum for this purpose shall consist of a member or members from two-thirds of the states, and a majority of all the states shall be necessary to a choice. And if the House of Representatives shall not choose a President whenever the right of choice shall devolve upon them, [before the fourth day of March next following,] then the Vice President shall act as President, as in the case of the death or other constitutional disability of the President. The person having the greatest number of votes as Vice President, shall be the Vice President, if such number be a majority of the whole number of electors appointed, and if no person have a majority, then from the two highest numbers on the list, the Senate shall choose the Vice President; a quorum for the purpose shall consist of two-thirds of the whole number of senators, and a majority of the whole number shall be necessary to a choice. But no person constitutionally ineligible to the office of President shall be eligible to that of Vice President of the United States. Representatives shall be apportioned among the several states according to their respective numbers, counting the whole number of persons in each state, [excluding Indians not taxed]. But when the right to vote at any election for the choice of electors for President and Vice President of the United States, representatives in Congress, the executive and judicial officers of a state, or the members of the legislature thereof, is denied to any of the male inhabitants of such state, being twenty-one years of age, and citizens of the United States, or in any way abridged, except for participation in rebellion, or other crime, the basis of representation therein shall be reduced in the proportion which the number of such male citizens shall bear to the whole number of male citizens twenty-one years of age in such state. The terms of the President and Vice President shall end at noon on the 20th day of January, and the terms of senators and representatives at noon on the third day of January, of the year in which such terms would have ended if this article had not been ratified; and the terms of their successors shall then begin. This article shall be inoperative unless it shall have been ratified as an amendment to the Constitution by the legislatures of three-fourths of the several states within seven years from the day of its submission to the states by the Congress.